In section 5.2 Set up a Load Transient Simulation, you modified the schematic to run a pulse load test on the complete closed loop converter. The schematic completed in that section is large and difficult to navigate. A natural progression is to add a level of hierarchy - that is, modify the schematic to use sub-blocks, or child components,with each sub-block representing some portion of the circuit, like the compensator. SIMetrix/SIMPLIS has an easy-to-use system for dividing schematics into sub-blocks. Each sub-block is called a Schematic Component and is saved as an individual file containing both the schematic and the symbol representing that sub-schematic. In this section you will create a schematic component out of the compensator portion of the schematic. Module ports define the electrical connections from the sub-schematic to the parent schematic. Schematic component files are containers similar to schematics but with an additional space reserved for the symbol. Symbols can be auto created by SIMetrix/SIMPLIS. After circuit blocks are divided into a hierarchy, you can create a truly modular design by swapping blocks that have common functionality and a common symbol. The hierarchical compensator block you create in this topic can also easily be used in other models. How to add module ports to schematics. How to automatically create symbols for hierarchical components which connect to those module ports. How to edit symbols using the symbol editor. Adding module ports to the schematic to identify which nodes connect to other blocks. Saving the schematic as a schematic component file. Creating a symbol which has pins corresponding to the underlying module ports. Note: An automated system exists to generate symbols for schematic components. To get started, you will need the schematic from the last section. 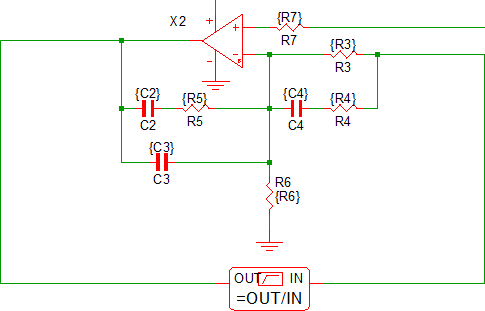 You can download a schematic at this stage here: 12_SIMPLIS_tutorial_buck_converter.sxsch. Using either the keyboard shortcut H or the menu selection, Hierarchy > Place Module Port , add module ports to the two inputs, the output, and the power supply of the OpAmp as shown below. Note: As you place the module port symbols, you can press F5 to rotate the ports as needed. To save your schematic component to a file, select File > Save Schematic As... . Note: To keep your reusable blocks separate from the top-level schematics, it is good practice to save your schematics to a sub-directory of your schematic directory. This tutorial uses D:\SIMPLIS Tutorial for the schematic and a sub directory, D:\SIMPLIS Tutorial\Modeling Blocks, for the schematic components. 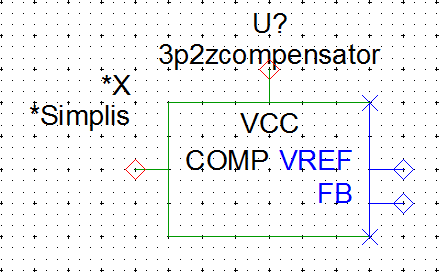 Name your schematic component 3p2zcompensator.sxcmp. 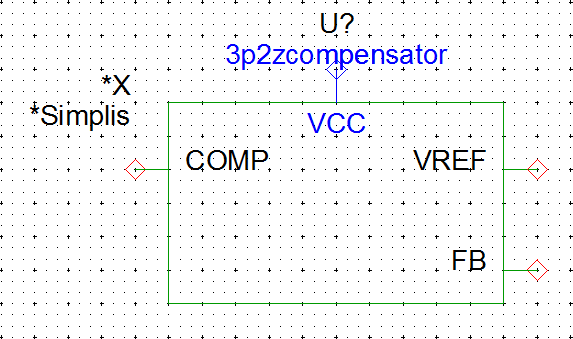 Note: The compensator schematic component file saved at this stage can be downloaded here: 3p2zcompensator_1.sxcmp. 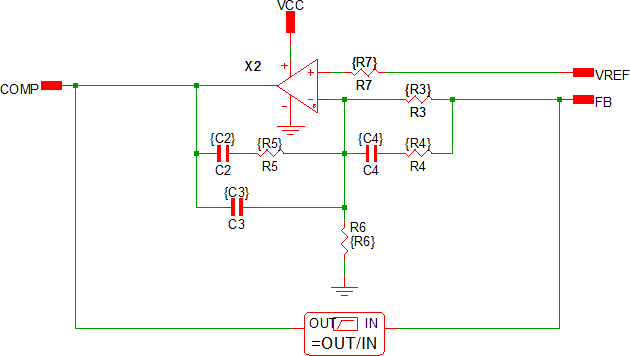 Save your schematic component using Ctrl+S. The compensator schematic component file saved at this stage can be downloaded here: 3p2zcompensator_2.sxcmp. 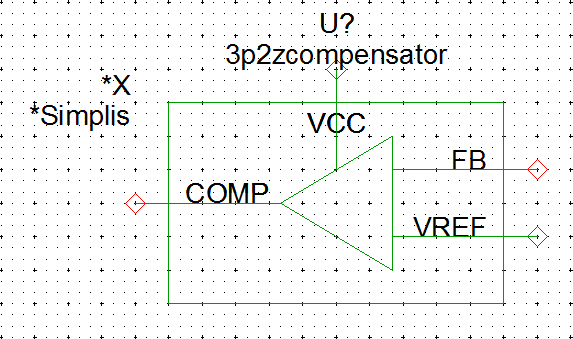 With the compensator schematic open, select Hierarchy > Open/Create Symbol for Schematic... , or press S to create a new symbol for this schematic. Result: The symbol editor opens with an auto-created, default symbol. This symbol has all the connectivity information and symbol properties to netlist the underlying schematic correctly in SIMetrix/SIMPLIS. Note: The symbol pins are automatically placed on each side of the symbol corresponding to the locations on the underlying schematic. 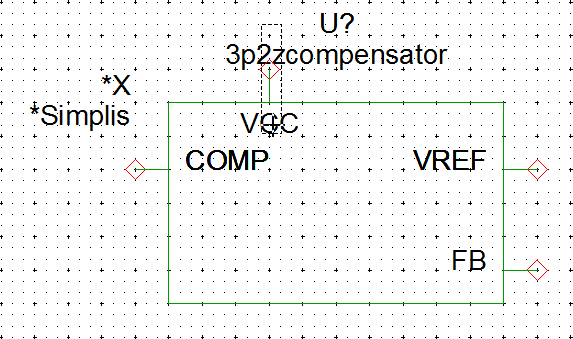 For example, the VCC port is on the top of the schematic and is also on the top of the symbol. Although this symbol has all the needed electrical functionality, it could use some modification to make the function of the underlying block easier to see. In this next procedure, you will select the symbol pins and make the symbol larger than the auto-created size. Hold down the left mouse button and drag a box around the input pins on the right side of the symbol. Make sure your box includes any portion of the VREF and FB text so these elements will be selected. Result: The symbol pins, symbol pin text, and the vertical line on the right hand side are selected. Drag the selected portions of the symbol to the right 4 grid squares so your symbol looks like the image below. Now that you have enlarged the symbol, you can move the pins to locations which will make it easier to wire the components to the parent schematic. In the next procedure, you will swap the positions of the VREF and FB pins, and center the pins on the symbol. 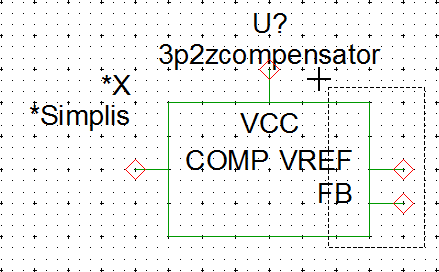 Result: The VCC pin and VCC text are selected. 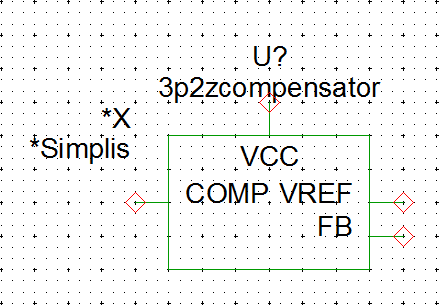 Note: The 3p2zcompensator text is also selected but this text is a symbol property and its position is controlled elsewhere. This symbol property is set to be centered on top of the symbol, so it does not matter that it is selected. Move the selected VCC pin to the right two grid squares, bringing it to the center of the symbol. Tip: It will be easier to move the VREF and FB pins if you move the VREF pin before you move the FB pin. The final step in modifying the symbol is to add graphical lines which describe the functionality of the underlying symbol. Although this step is completely optional, these graphical elements are helpful for others to identify the function for each block on your schematic. Double-click to start a line. Single-click to add a corner to a line. Right click or press Esc to end a line. As mentioned in the introduction to this section, symbols for schematic components are saved to the schematic component file along with the schematic. Other symbols for built-in parts, such as the resistor and waveform generator, are stored in symbol libraries. 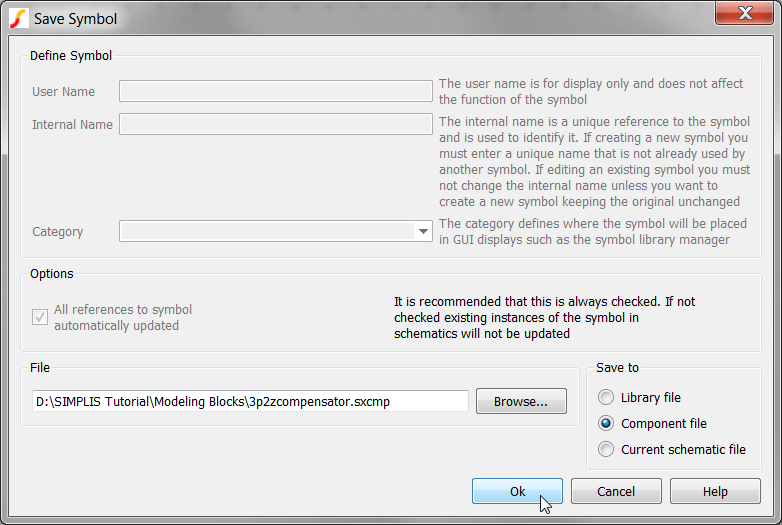 The program knows that this symbol, however, is configured to be saved to the schematic. The compensator schematic component saved at this stage can be downloaded here: 3p2zcompensator.sxcmp.